David Nelson Collins - "Black Bear Near Black Balsam" - "Upper Catawba Falls"
David Nelson Collins likes to live large. A recent arrival to Black Mountain (he has lived in the McCoy Cove area for just two years), he has already made a big mark on the arts scene here. Collins moved here from Florida where his career involved chemical manufacturing plants, concrete redo-mix, and janitorial supplies. Collins started painting in 2005, but you won’t find most of his work in art galleries. He believes that galleries limit the audience for art. He prefers to create very large installations that are visible to everyone. One of his favorite projects has been a twenty-foot tall giraffe he installed in Lakeland, Florida. Another is a collection of twenty-two sculptural pieces in human form, also in Lakeland. His aim is to create art in public places here in Western North Carolina. He hopes to inspire others to join him in creating more large public art installations in the Black Mountain area. He would love to be invited to paint a mural on a wall in downtown Black Mountain and is trying to track down the owners of certain buildings where he has seen walls just begging for murals. This year marks the first time Collins has created rocking chairs for the Little Town that Rocks show. 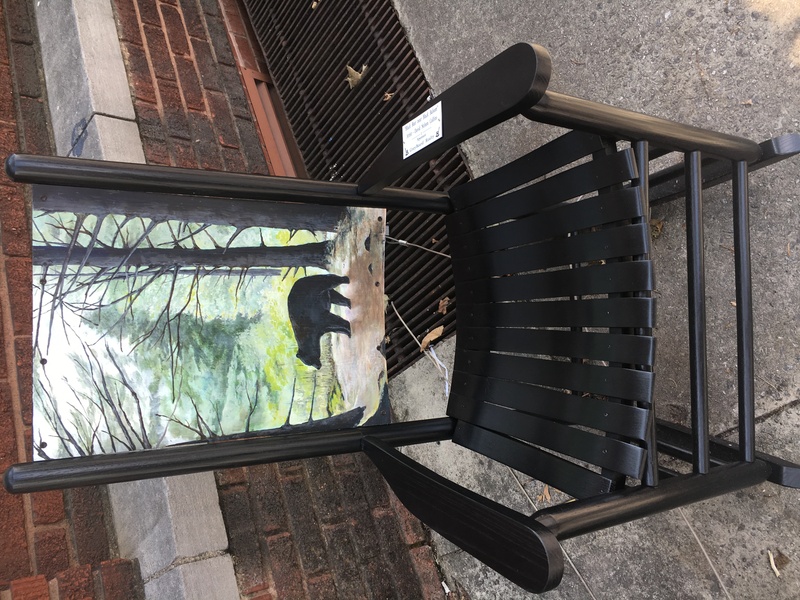 Painting these chairs fits right into his idea of creating art to be placed outside for maximum exposure. 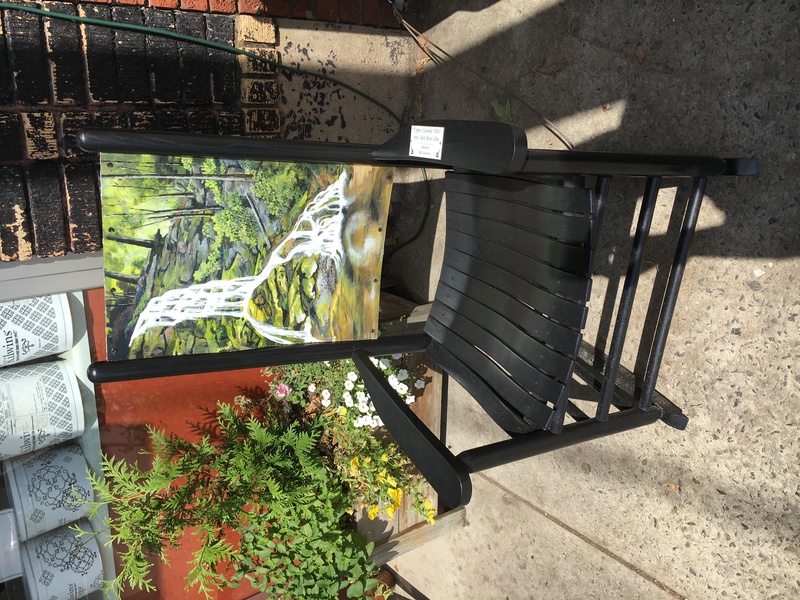 He did two chairs: one depicts a bear in the forest, and the other is a waterfall. Nature provides his inspiration in much of his work. His next big project is a painting done plein-air from every overlook on the Blue Ridge Parkway. He expects this project to take him three to four years.